from 3 pcs. 3,91 EUR ea. from 10 pcs. 3,40 EUR ea. from 20 pcs. 3,15 EUR ea. from 40 pcs. 2,92 EUR ea. Bestseller: More than 390 000 sold! 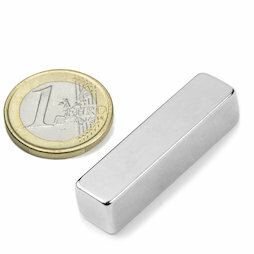 A very slim block magnet with an adhesive force of impressive 15 kg. Our customers build it into lamps or wood/metal furniture.